Over the last week or so I've opened 3 new options positions and closed 1 other. So it's been a pretty active last week. I typically prefer to sell put options rather than call options; however, I still own some legacy shares from my previous employer that were acquired through the employee stock purchase plan (ESPP). The plan was great, but since I no longer work there it doesn't make sense to keep the shares in my portfolio since it doesn't really fit into my overall portfolio. I had sold a call option on these shares previously and closed it out early taken in a profit of $38.01 of net premium. It wasn't the best move, but I'm happy with how it played out considering the share price jumped to right around my strike price with less than a week until expiration. On November 30 OPEC announced a token cut to oil production levels and that sent oil prices, and the related companies, surging. 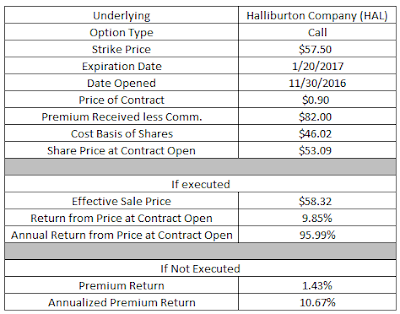 I decided to use that large increase as an opportunity to sell another call option on my Halliburton shares. However, this one is in a much better situation since the effective sale price is actually above my required sale price due to ESPP taxation. If the share price remains below $57.50 then the call would not be executed and I'll just get to keep the option premium as profit and move on to other options. I calculate the premium return based on the capital that would be received at the strike price which in this case is $5,750. The premium return would represent a 1.43% or 10.7% on an annualized basis. If the share price moves higher than $57.50 then the option would move "in the money" and I'd have to sell 100 shares. 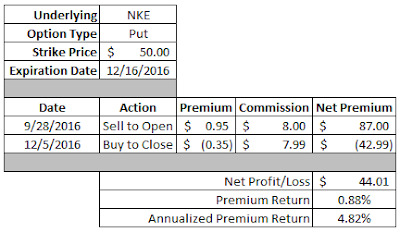 However, in the case of call options the premium gets added to the strike price. So for this call option my effective sale price would be $58.32. Based on the share price at the time the contract was opened that would represent a 9.85% return in a little over 1.5 months or 96.0% on an annualized basis. Ideally I would close this call option early at a profit and just keep cycling through a few more call options picking up premium along the way until the shares are called away from me. My target is to capture 50% of the premium and then close out the call option. Since the election Unilever's share price has been under fire due to the strong rise in the US dollar. Since Unilever is a foreign company that does lots of business in the United States a rising dollar will hurt their numbers on the surface. While that's a very real short term concern over the long run I expect the dollar to revert back to normal levels which will be a tailwind for foreign companies. I had been contemplating an outright purchase of shares, but decided to go the options route first. On December 1st I sold to open a put option on Unilever to try and generate extra income that way or buy shares at a discount. That's why I think put options, when done correctly, can be a best of both worlds scenario. If the share price falls below $37.50 then I'll have to purchase 100 shares of Unilever for the strike price less the premium received. That works out to an effective purchase price of $37.00. At the time the position was opened the share price was trading around $39.20 so my purchase price would be for a decent 5.6% discount. At that purchase price my yield on cost would be around 3.71% based on the current dividend payment and the current exchange rate. That would represent a decent value based on the analyst estimates with a 18.9x P/E on 2016 earnings and 17.6x P/E on 2017's earnings estimates. If the share price stays above $37.50 then I'll get to keep the option premium as profit. Based on the capital at risk that would represent a 1.33% return in just over 1.5 months. On an annualized basis that's a solid 10.1% return. On Monday of this week Nike's share price jumped over 2% from Friday's close up ending the day at $51.85. That relatively large bump allowed me to close my open put option on Nike. If you recall I sold to open a $50 put option back at the end of September with an expiration date of December 16. I was just fine with how that trade was set up and would have been content whether the shares were put to me or I just got to collect the premium as profit. When I sold the put option back in September I received $87 of premium. Unfortunately the only way I'd get to keep all of that as profit is if the option went all the way to expiration and was out of the money. Since I had to buy back the option to close the position that cost me $42.99 after commission/fees. The net profit on the trade worked out to $44.01 which represents a 0.88% return. On an annualized basis that's a 4.82% return which isn't stellar, but I'm happy with how things worked out. No that's not a typo, I went back to the Nike well. After Monday's 2% move higher, Tuesday saw things reverse course and shares were trading down over 2%. That opened up the possibility to sell another put option on Nike. If the share price of Nike falls below $48.50 then the put option would move "in the money" and could be executed. 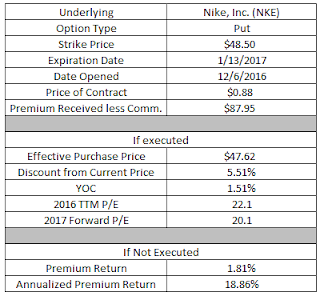 If executed I would be forced to purchase 100 shares of Nike for the strike price ($48.50) less the premium received ($87.95/100) or $47.62. This put option strays from my normal 10/10 strategy where I aim for 10% downside protection or a 10% annualized return from the premium. I felt that it was appropriate to deviate from that strategy since I'd be more than happy to purchase shares of Nike at a $47.62 price. Therefore I wanted to be a bit more aggressive with the strike price selection in order to generate a higher premium return. Plus it's not like it's a bad valuation for one of the few large cap companies that I can see a clear path to real growth of revenues and earnings and of course dividends. Based on fiscal year 2016's earnings of $2.16 that would put the trailing P/E ratio at 22.0. On a forward looking basis that share price would put the P/E ratio at 20.1. Considering the probability of Nike continuing to grow earnings at a 10%+ rate annually that's a solid valuation. If the share price remains higher than $48.50 then I'll get to keep the option premium as profit. Based on the capital at risk that would represent a solid 1.81% return in about 5 weeks or 18.9% on an annualized basis. Overall I'm pretty happy with the 4 different moves that I made. Thus far in December I've generated $44.01 in option profit and since September I have a $270.42 profit. Although that does include the Target Corporation (TGT) call option that went horribly wrong and is currently showing over a $320 loss. Since I only book options moves as a profit when the position is closed I have one leg of that call showing a loss, but I rolled up and out the call for a net credit. 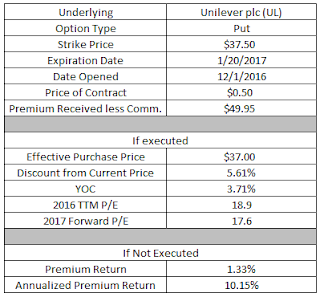 Excluding the loss from the one closed leg of the Target call pushes the annual option premium up to $594.16. Within my Rollover IRA I'm potentially on the hook for just over $67k worth of purchases via put options. That's brushing up on my hard limit of 50% of assets from my Rollover IRA being used for options so I don't expect too much more activity until some of my open positions expire or are closed. December will likely be a busy month for options activity. I currently have 3 options expiring with the December option cycle and 4 others expiring in January. Each of those positions has the possibility to be closed early. What do you think of these options moves? 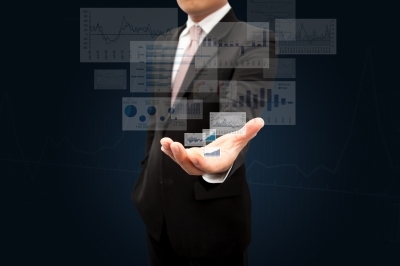 Do you use put options to effectively set limit order on companies you want to purchase? Great UL put. I almost sold the exact same one last week. I'm going back and forth, do I sell a put or buy and sell covered calls. I want to own the stock, but I want it to drop a bit. Nike, Inc.: Just Do It!